Jonathan Stroud's novel Lockwood & Co.: The Screaming Staircase has a surprising amount in common with the Travel Channel series Ghost Adventures. Sure, The Screaming Staircase is the product of an award-winning, New York Times best-selling author, while Ghost Adventures is a ridiculous show about a bunch of shrieking dudebros racing around and swearing at (allegedly) mysterious noises, but both center around ghosts, ghost-hunting technology, and cheerfully ghoulish storytelling. The Screaming Staircase is narrated by Lucy Carlyle, the newest employee of Lockwood & Co., one of the many ghost-hunting agencies that have sprung up in London in response to a recent infestation of hauntings. 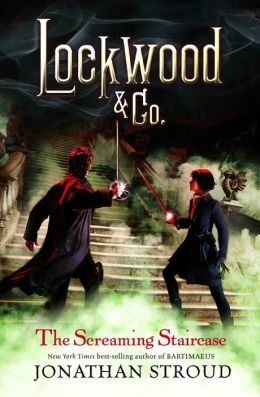 Children tend to have the strongest psychic gifts, so most agencies are staffed by a mixture of young agents and adult supervisors, but Lockwood & Co. is run solely by kids—Lucy offers the strongest supernatural talent, company founder Anthony Lockwood serves as their public face, and slovenly, clever George Cubbins handles research. Business is steady, but when a case goes seriously wrong the agency is slapped with a massive fine. Desperate to raise the money, Lucy, Anthony, and George take on their most dangerous case yet: the clearing of Combe Carey Hall, one of the most haunted mansions in England. This is the first book of a series, and it's set the standard very, very high—The Screaming Staircase is suspenseful, smart, and frequently quite funny. There's no romance to speak of, but the trio's relationships are full of the kind of layered hints and subtext that leave fanfiction writers all a-quiver. The action scenes come fast and furious, and the supernatural stuff walks a fine line between young-reader-appropriate and genuinely scary. My only quibble was that the actual mystery was pretty easy to figure out, but I'm hoping Stroud will increase the complexity of the whodunits in his future installments, and meanwhile I have total faith in his ability to sustain the creepy charm that made this first story so much fun.